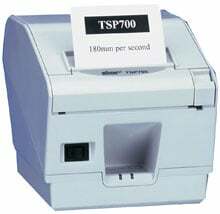 The TSP700 Series series high speed and small footprint printers can benefit any business. The super fast TSP700 Series 2-color thermal printer is packaged in a small footprint and is ideal for POS, credit card, restaurant, barcode, hospitality, and kiosk applications. Businesses can really benefit from the ultra high print speed. The TSP700 Series enables you to print receipts with logos and barcodes plus add coupons or rebate certificates while decreasing customer wait time. The TSP700 Series can store multiple logos or coupons in the printer, allowing you to print a company logo or coupon with every receipt, even when using a serial printer. Thermal, two-color printing, 7 ips, Ethernet interface. Includes auto-cutter. Order cables & power supply separately. See accessories. Color: Dark gray. Also known as TSP743IIL-24 GRY. Thermal, two-color printing, 7 ips, serial interface. Includes auto-cutter. Order cables & power supply separately. See accessories. Color: Dark gray. Also known as TSP743IID-24 GRY. Thermal, two-color printing, 7 ips, parallel interface. Includes auto-cutter. Order cables & power supply separately. See accessories. Color: Dark gray. Also known as TSP743IIC-24 GRY. Thermal, two-color printing, 7 ips, serial interface. Includes auto-cutter. Order cables & power supply separately. See accessories. Color: putty. Also known as TSP743IID-24. Thermal, two-color printing, 7 ips, parallel interface. Includes auto-cutter. Order cables & power supply separately. See accessories. Color: putty. Also known as TSP743IIC-24. Thermal, two-color printing, 7 ips, Ethernet interface. Includes auto-cutter. Order cables & power supply separately. See accessories. Color: putty. Also known as TSP743IIL-24. Thermal, two-color printing, 7 ips, Ethernet interface. Includes auto-cutter. Order cables & power supply separately. See accessories. Color: Dark gray. Thermal, two-color printing, 7 ips, 802.11b wireless interface. Includes auto-cutter. Order cables & power supply separately. See accessories. Color: gray. Thermal, two-color printing, 7 ips, USB interface. Includes auto-cutter. Order cables & power supply separately. See accessories. Color: gray. Thermal, two-color printing, 7 ips, USB interface. Includes auto-cutter. Order cables & power supply separately. See accessories. Color: white. Thermal, two-color printing, 7 ips, 802.11b wireless interface. Includes auto-cutter. Order cables & power supply separately. See accessories. Color: Dark gray. Thermal, two-color printing, 7 ips, USB interface. Includes auto-cutter. Order cables & power supply separately. See accessories. Color: Dark gray. Thermal, two-color printing, 7 ips, USB interface. Includes auto-cutter. Order cables & power supply separately. See accessories. Color: putty. Thermal, two-color printing, 7 ips, Port-PoweredUSB interface. Includes auto-cutter. Order cables & power supply separately. See accessories. Color: Dark gray. Thermal, two-color printing, 7 ips, Ethernet interface. Includes auto-cutter. Order cables & power supply separately. See accessories. Color: putty. This is a phenominal printer, as most things from Star Micronics are. I have implemented dozens of these at my offices around the Country and have never come across a situation in which it was not the best fit for our needs. Very reliable, quick, inexpensive, and easy to maintain from a troubleshooting perspective. The only potential downside is that, when connecting this printer to new USB ports on a PC, Windows often creates a *new* copy of the printer, additional to the one(s) that were already there, which can cause confusion to the end-user in some cases unless the old copies are removed.